Edited by: Judith H. Hollingsworth, Kenneth R. Hollingsworth. Series edited by: Roger M. Blench. 10 pp. Roman, 502 pp. Mofu-Gudur, also Southern Mofu, is mainly being spoken in the districts of Mokong and South Mofu, in the Far North Province of Cameroon. The name Mofu was originally used as an umbrella term for the many related ethnicities and languages of the region. Beside the Gudur, there are many ethnic groups today, who accept that name. Dieu and Renaud (1983) describe Mofu-Gudur as a member of the Southern Mafa group of the Chadic languages. The Ethnologue (www.ethnologue.org) places it together with Giziga into a sub-group of the Biu-Mandara branch of that language family. According to SIL sources, today there are about 60,000 speakers of Mofu-Gudur, most of them living as agriculturalists in the Mandara mountain range. 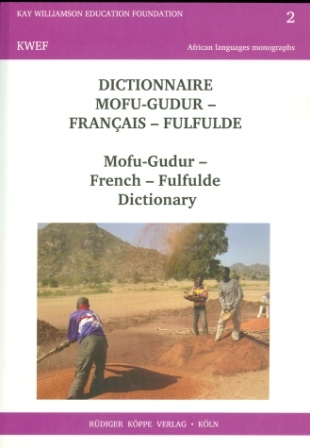 Approximately 6,000 Mofu-Gudur terms are given with definitions in French and Fulani, a major lingua franca in Cameroon. They are accompanied by numerous descriptive phrases and illustrations. The appendix comprises of a description of the Mofu-Gudur number system, a short treatise of the orthography and the various transliterations into French and Fulani, numerous maps and a bibliography. Thanks to the very descriptive definitions and examples given in French and Fulani, this dictionary is not only of interest to linguists and Africa scholars. It also aims at the countless Mofu in Cameroon and the diaspora, to give them a means of preserving their heritage and culture through their language.